In this series I will be sharing 6 interesting facts I didn’t know about when I started using positive reinforcement in training animals. This is part 1. People often get the wrong impression about equine clicker training. They think you need to keep clicking and feeding for ever. That’s not true at all! I think it is because there are so many videos out there about teaching our horses new behaviours. 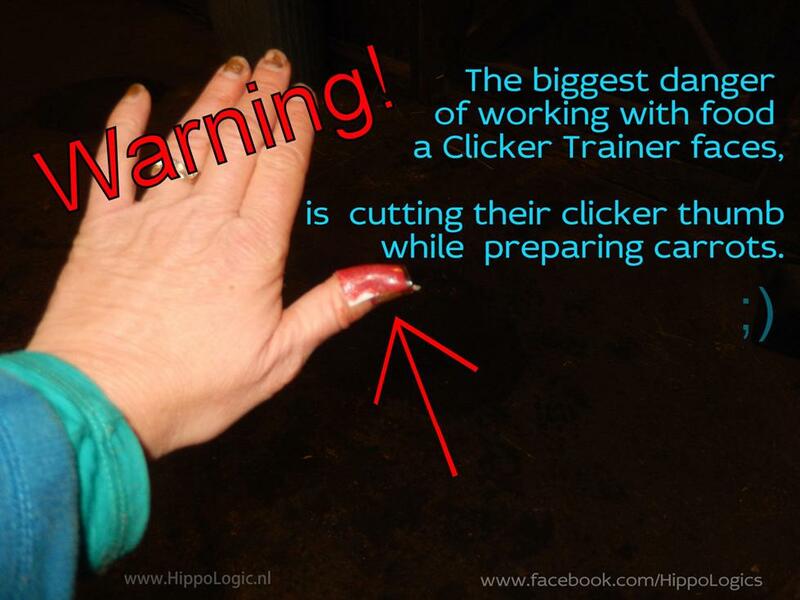 If you see a lot of those videos you indeed can get the wrong impression and could be mistakenly thinking that we clicker trainers never stop clicking and are always giving treats. Once the horse understands the new or more desirable behaviour, the marker (click) and food are faded out. We still reinforce the behaviour once in a while with an appetitive (treat, praise, scratches or with other reinforcing behaviour), but we don’t keep clicking and feeding treats for the same behaviour over and over. If we would do that, it would decrease the goal behaviour rather than it would keep it’s quality or increase it. Part of the power of positive reinforcement is that there is a chance of getting a reward once the behaviour is trained. That chance can also involve to do other behaviour (one that they really like to do). That will make the horse always want to perform his best. After the first few sessions of clicker training the horse starts to pay attention to the click and his behaviour at the the time of the click. In clicker training he focus shifts pretty quickly from the food to the click and their own behaviour. If people make videos about clicker training their horse, they are usually filming behaviour that is in the process of being taught, not behaviours that are already well trained and established. Therefor the horse is clicked and reinforced a lot in those videos. The clicks and treats are faded out after the goal behaviour is trained. If you want to share this blog on your social media, use one of the share buttons below. It’s very much appreciated! I love to hear from you, so please add a comment or let me know if you have a question. I read them all! Are you ready to get the results in training you really, really want? Do you wish you had more confidence in training your horse with R+? Would you like to have a supportive community to help you implement all 12 Key Lessons to Your Success? Did you know HippoLogic has a membership program to support you in getting results in training? I think what makes certain horse trainers more successful than others is ‘communication’. To me the result of training is not the most important part. 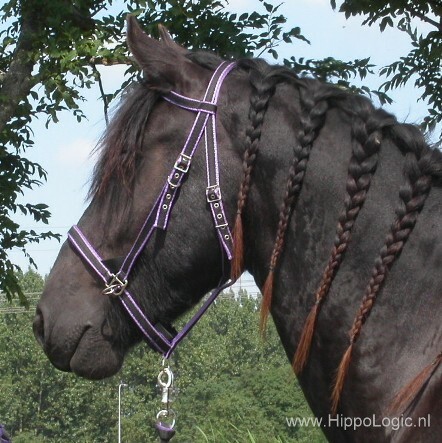 The most important component of horse training is the way the trainer got that result with the horse. In other words: the training method and the way it is communicated weighs more than the actual result, the behaviour. The more I learn about body language and natural behaviour of horses, the more clearly I see if the horse is stressed, anxious, troubled, in pain or skeptical about the things the rider or trainer asks him to do. That takes the joy out of watching horses perform without willingness and eagerness to work with their handler. That is the reason I avoid the main acts on horse events. I would rather talk to passionate horse owners who think the horse matters too or are looking for ways to find out if what they do is as enjoyable for the horse as it is for them. 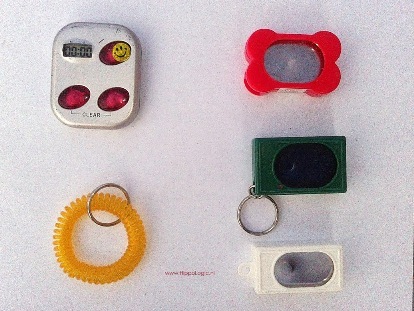 When I started clicker training I didn’t realize that I had a powerful communication tool in my hand. The more positive reinforcement training I do, the more I realize that my bridge signal (the marker) functions as a very precise tool, like a scalpel. I can change the tiniest details in a behaviour to my desire. 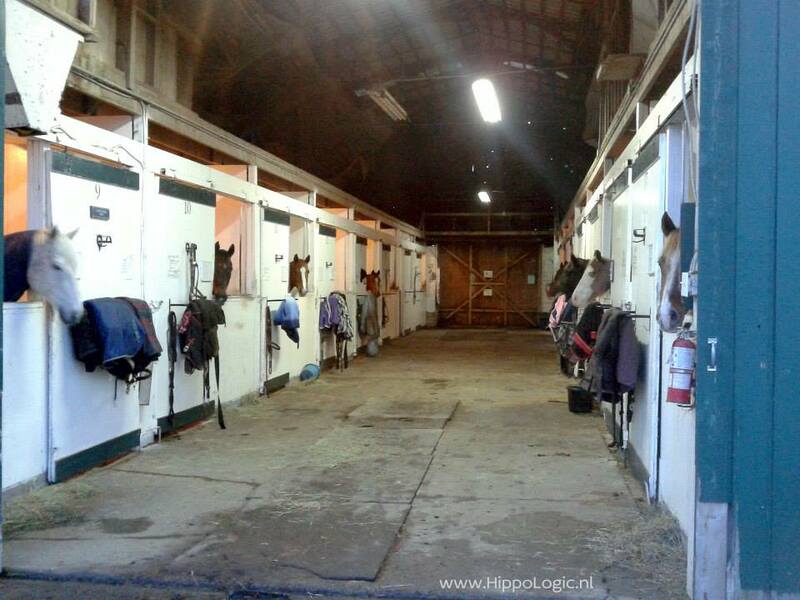 It communicates so clearly what it is I want from my horse, it is amazing that more people are not use it. The bridge signal is the most important communication tool in working with rewards. The bridge signal marks exactly the behaviour the horse earned the reward for. Click: this is what I want. How more clear can you get? 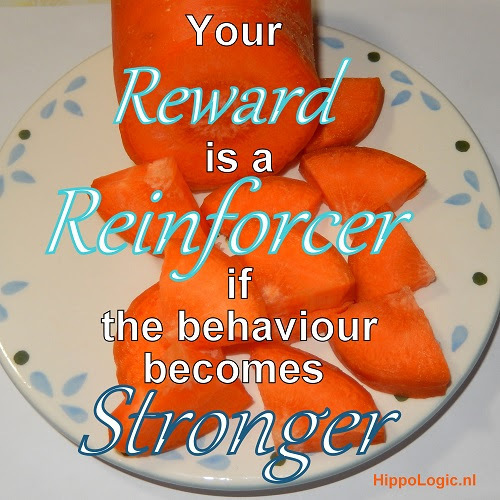 The third very important pillar of training is the category of reinforcers a trainer uses. If it is negative reinforcement, the horse learns basically through avoidance. The wanted behaviour is reinforced by avoiding an unpleasant stimulus. Negative reinforcement (-R) is sometimes referred to as avoidance learning. For example yielding for pressure. Even when the unpleasant stimulus changed to a very light cue or just a body movement of the trainer, the brain will still associate the cue with the way the behaviour was triggered, the aversive. This is the reason negative reinforcement works so well: one can fade out the aversive but it still works because of the association in the brain. If the learning happens because the horse is getting something he wants, something pleasant that is added to reinforce the behaviour (positive reinforcement), he will try to earn another reward. The association the trainer builds in the horse’s brain is a pleasant one. The horse will actively seek out behaviours that got him rewarded in the past. The trainer stimulates the intelligence and the creativity of the horse with rewards. These horses are offering new behaviours all the time. Something you will not see in seasoned -R trained horses. This is the eagerness and the joy one can spot in a +R trained horse. I see so many talented and knowledgeable clinicians, horse trainers and riding instructors out there, who could be even more successful if they would only use bridge signals in their training and lessons. The bridge signal marks the wanted behaviour in the horse, but it also clearly shows to the rider/handler what the instructor means. I wish more people understood the importance of a bridge signal paired with a pleasant stimulus (reward). Of course it’s intertwined with understanding what the horse communicates back to you and the reinforcers that make it worthwhile for the horse. I think the bridge signal is the best kept secret in horse training and I think it is time to reveal this powerful tool to every horse lover, rider, trainer and instructor. Share this message if you agree. We all use or have used verbal praise and a pat on the neck as reward for a horse.Was it helpful? Did we get more of the desired behaviour? In other words: was it reinforcing the behaviour we wanted? What is a reward while training and how can we measure its value? A reward is an event that is added during or directly after a certain behaviour that reinforces that behaviour. If we don’t see any increase in the behaviour or the effort to display that behaviour it wasn’t a real reward or it was not associated with the behaviour. In order to associate a reward with the behaviour we must give the reward during the desired behaviour or within a few seconds. Horses that get a bucket of grain in their stall after they performed well in the arena will not associate their behaviours in the arena with the bucket of food. Therefor the horse will increase their performance next time, at least not due to the food. That is why positive reinforcement trainers use bridges. If the reward doesn’t reinforce the behaviour, it wasn’t a reward for the horse. Most Dutch people learn to ride in a riding school and we have learned to pat (sometimes it looked more like slapping) the horse on the neck as reward. In hindsight: I have never seen any increase in the behaviour that was ‘rewarded’ this way. During dinner time a lot of horses are kicking their doors. Why do you think that is? I think because they think that they will get food because they kick the doors. After all: they always get their food while they are kicking their doors. I have worked at stables and even if I was only working in the weekends, it would take me about 4 weeks to teach most horses (25 out of 30) that the desired behaviour was: 4 hooves on the floor and ‘looking’ away (head in their stall so I could throw in their hay from the corridor). It took a bit of patience and consideration during feeding time, but it was rewarding for all parties. For me because I saved time and it made my work safer. Horses that are ‘looking away’ when I am feeding them grain or hay can’t snap at their food with all the dangers that come with it. A few weeks later all the horses learned the new, safer behaviour. For the horses because they got ‘jackpotted‘ every morning: grain and the second time I came: a bucket of grain. So next time you are rewarding your horse: pay attention. Is it really rewarding? And does it increase the behaviour you desire. For tailored advise, please visit my website and book a personal consult today! Recently I have received the same question from several people. Why do you need a clicker when you could just use your voice as a bridging signal? What are the advantages of a clicker? If you want to reinforce certain behaviour one has to reward the horse at the moment the behaviour is still going on or within a few seconds the behaviour has stopped in order for the animal to associate the behaviour with the reward he is receiving. It is almost impossible to give the horse his reward during the behaviour, which is why positive reinforcement trainers use a bridge signal. A bridge or bridging signal is a specific signal for the horse that connects the moment the reward is given to the behaviour he was doing. Most clicker trainers use a special device named a clicker as bridge. The clicker makes a click sound. When the horse has learned that a click is always followed by a reward, the horse starts to pay really good attention to the behaviour he was displaying at the time of the click. He is smart and he wants to train you to give him more clicks. Animals like it when they have the feeling they can control the environment (you and his rewards). A clicker always makes the same sound and therefor it ‘travels’ the same path in the brain. The horse understands quickly what the sounds means. A click is not influenced by emotions of the human voice. It doesn’t matter who presses the clicker, it still sounds the same. So other people can ride and train your horse without confusing the horse about the bridge signal. The click of a clicker can be delivered instantly. Timing is everything. The more accurate your bridge is, the easier the horse learns what you want to reward him for. As long as the bridge signal is a specific sound it can be used. I taught my horse to respond to different bridges. I use the high pitched and long stretched word “Good” as bridge and Kyra also knows that my tongue click is a bridge. The main advantages of a verbal bridge and a tongue click are obvious. The first is that you always have it with you. No matter where you go you can always use your bridging signal. The second is being able to keep your hands free. Using a clicker always requires a hand to click with. In some situations being able to use both hands can have be a huge advantage. A vocal bridge always has a little delay, because before you can speak you have to inhale fist. Your voice also can differ according to circumstances: a cold may effect your voice, but also your emotions. When I am excited or annoyed the pitch can change, for us it means the same thing because we know the meaning of the letter of a word. A horse knows the meaning of the sounds of a word. Because your voice sounds only “generally” the same every time, it makes a different, wider pathway in the brain. This sound means: a reward is coming. And this one too. And this one means the same thing. The horse needs to decide every time he hears your voice: was this a bridge or not? Therefor it can take a little longer for the horse to become “clicker savvy” with a voice bridge. When I introduced the word “Good” I still lived in The Netherlands. They generally don’t speak English to horses, so it was a safe word to use. It was a unique sound. I was the only one who used it and my horse was never trained by someone else. The difficultly with the word “Good” in Canada is that other people use it as praise (reward) instead as bridge signal. That means it might not always be followed by a reward. 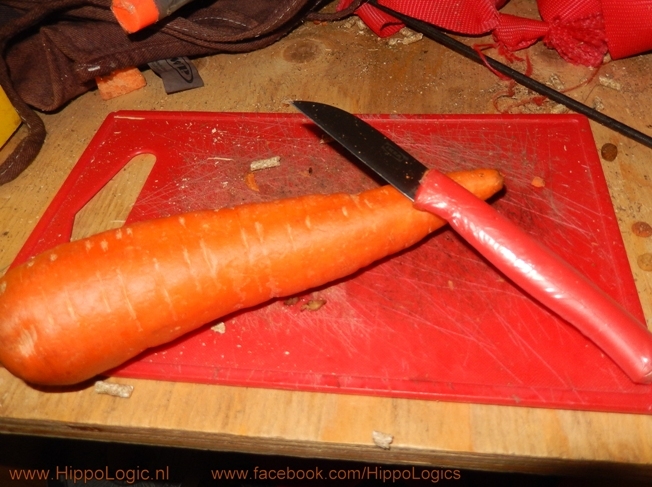 This can confuse the horse. Another reason to teach your horse the click of a clicker as the bridge: other people can train or ride your horse and communicate clearly. The click sounds the same every time. The first day her finger got stuck between the stall door. And a few days later her other finger got caught in the lead rope while she was tying her horse. Well, it was her first horse, what can I say… Horses and or being around them can be dangerous. Yesterday I wanted to do some clicker training sessions with Kyra. I am participating in a Clicker Challenge on Facebook. The end goal is to position the horse 1 meter in front of a pedestal made of 2 little blocks of wood or stepping stones, give your horse a cue to mount the stones, let him stand for 20 seconds, reward and then dismount backing up. Anyway, Kyra’s best motivator is food, so that’s the reward I use the most. I think everyone has heard about the dangers working with food as a training tool. Yesterday I got hurt for the first time! I am not talking about the myths about using food as training tool, like ‘your horse will become pushy and will mug you‘ or ‘your horse will try to bite you in order to get the food’. We all know that this is key lesson #1 in clicker training: teaching your horse to behave around food. Here I am talking about something else. Let me explain. I was preparing the treats. I wasn’t paying attention, which was my mistake, and I cut my thumb! Ouch! It was a really deep cut and I can tell you it hurt. Badly. It was bleeding and bleeding and wouldn’t stop at first. Arggg, I just had my camera set-up and was planning to video my training. Although the pain was bad, worst of all: it is my favourite clicker thumb, my left one. Now what? 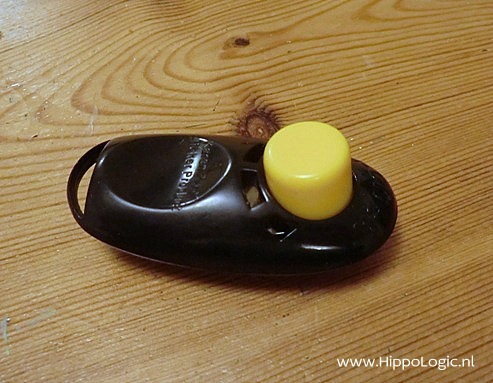 Pressing a clicker with the top of your thumb hanging loose wasn’t an option. And although it wasn’t a very nice experience, I had to laugh a little at myself. I am always telling people that there is no danger in working with food as training tool… Now I am injured. Worst of all: by myself. Please don’t laugh. PS I did train and used my right hand to click and feed. A bit ungainly but the show training must go on. Kyra didn’t care about my injury. I think she was just thrilled that I trained her anyway. Left or right hand, a click sounds like a click.